JoANNE BLACK, 84, of Anita, died Thursday, April 11th, at the Cass County Memorial Hospital in Atlantic. Per her wishes, cremation has taken place. There will be a private family graveside service for JoANNE BLACK at the Evergreen Cemetery in Anita, at a later date. 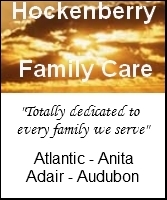 Hockenberry Family Care Funeral Home, in Atlantic has the arrangements.